CRAZY DISCOUNT! Was: $129.95 Now: $59.95! New Arrival! 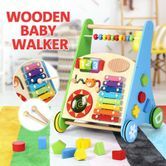 The Wooden Baby Walker Toddler Walker Baby Push Activity Walker Wooden Toys. It's a walker, activity center and a musical instrument. Buy one of these brightly colored baby walking toys and help them get better at manual dexterity, color perception, shape recognition as well as hand-eye coordination. This baby push walker rolls on 4 wheels which are painted in different colors. The activity walker includes bead maze, xylophone with wooden mallet, peg maze, 4 pieces shape sorter, rolling numbers as well as a storage area at the back. Made from solid wood and with the sturdy construction, the toddler walker is a perfect wooden toy for your kids to play with and learn skills! Great item fast processing happy with my purchase thank you.